It’s hard to believe, but we’re already in August! A new month, of course, means a new birthstone to celebrate. Those who are born in August claim the peridot precious stone as their birthstone. Unlike other stones like sapphires, diamonds, and topaz, the peridot is exclusively available in one color–green. However, the particular shade of green can vary from stone to stone. So in honor of August borns, let’s have a look at some gorgeous peridot jewelry. A beautiful pair of earrings that showcases the elegance of the peridot stone, these Peridot and Diamond Drop Earrings keep things classic. Crafted in 18k yellow gold, the pair of earrings includes faceted peridot stones weighing 11.37 carats in total with plenty of diamonds all around (1.15 carats) for good measure. With a hanging length of 37mm, these peridot diamond earrings will bring a gorgeous glow to anyone who wears them–especially to those born in August. For a flashier take on peridot jewelry, feast your eyes on these statement-making Spiral Peridot, Citrine, & Diamond Drop Earrings. 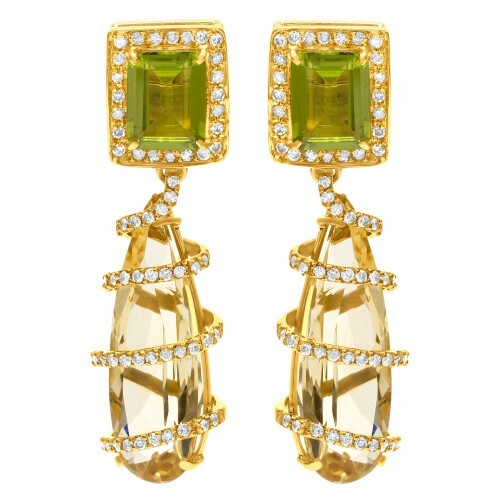 With a combination of 18k yellow gold, green peridot, bronze citrine, and white diamonds, these earrings will turn heads. The upper portion of the earrings includes emerald-cut peridot stone framed by diamonds all around. From there, an intriguing diamond-paved spiral seductively holds large faceted tear-drop shaped citrine stones for a stunning wow effect. Moving away from the ears to now the hands, this Rose Gold Peridot and Diamond Ring is a striking piece of peridot jewelry. 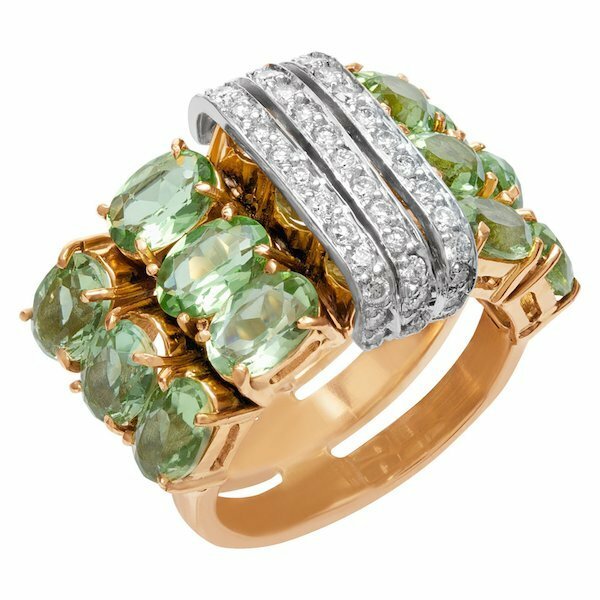 Set into 18k rose gold, this unique cocktail ring features an elegant mix of green peridot stones and classic white diamonds in sets of threes. Three rows of diamonds set into white gold wrap themselves around a rose gold ring with four rows of oval-cut peridot trios. 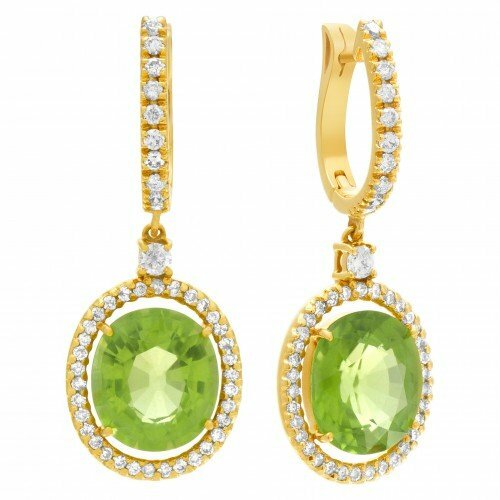 With a total of a dozen peridot stones, this is one August birthstone jewelry that flaunts the allure of rare green stone. 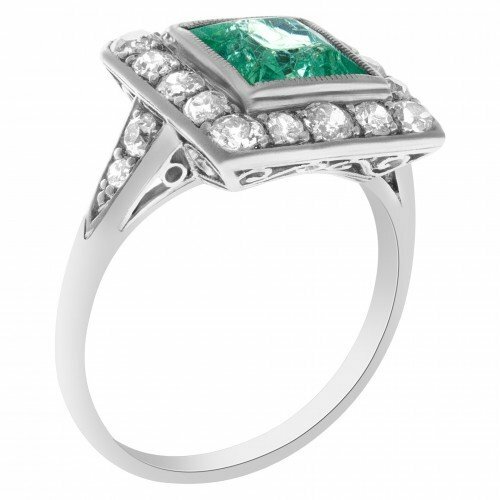 If vintage vibes are more your speed, then don’t miss this Platinum Peridot & Diamond Art Deco Style Ring. Made from precious platinum, the ring includes a dark green square-cut peridot stone at the center, bordered first by vintage-inspired milgrain detailing followed by a square halo of diamonds. There are even more diamond side stones on the band itself, while the gallery of the ring features Art-Deco inspired metalwork. 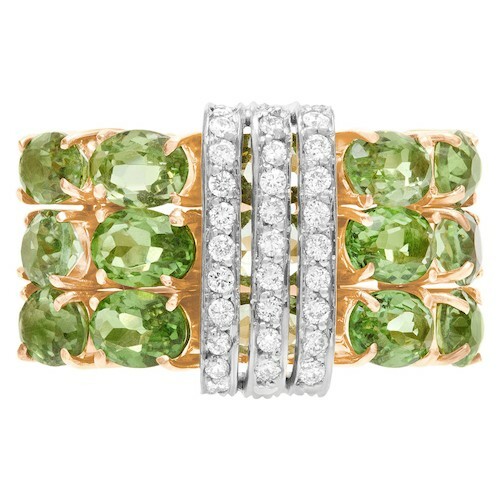 A very Great Gatsby-esque way to wear August’s peridot jewelry birthstone. Whether in a contemporary style or a rocking a retro design, the peridot stone is a lovely gem for fine jewelry. Green in color, rare in nature, and carrying a special meaning for August birthdays, it’s no wonder that the peridot stone is one of our very favorites to wear.